Remember the old Peanuts line: Happiness is a Warm Puppy? Lace curtains put a smile on my face. I'm a sucker for the delicate designs, the fresh white color, and the old-world charm. Unfortunately, the putting-up-curtains gene didn't come with the I-love-decorating gene. Getting on step ladders, stretching, and getting the edges of curtain rods to hook onto microscopic brackets is not only maddening, but downright dangerous. My latest stint with taking down draperies, washing, ironing, and re-hanging them almost ended in disaster. The valance on the bathroom window required a major stretch from the top of the step ladder. I felt myself wobbling, but thank God, I was able to regain my balance. That's when I called for reinforcements, a.k.a., my neighbor. With everything back in order and no broken bones, I mulled over the experience. My writing journey can mimic certain aspects of the dreaded curtain adventures. 1) No matter how I stretch to attain a skill level, there are times when I must seek expert advice. This comes in the form of critique partners, craft books, and asking lots of questions. 2) My early tries with window coverings were ignorance is bliss ventures. When I brought my fledgling fiction attempt to a writers conference and presented it, I had no idea what I was doing. 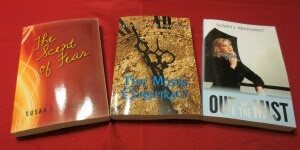 Thanks to kind writers and editors, they showed me how I could improve my novel. With much trial and error, my knowledge base expanded on both fronts. Everything, whether it's curtains or novels, has a learning curve. 3) The end result brings much satisfaction. New or freshly laundered curtains give the room a boost, and a well-written article or novel gives me that same "ahhh" moment. Writers and Readers: Finish this line: Happiness is... Then explain why. Let's have some fun today! Happiness is a walk on the beach, a child's laughter, and receiving a publication acceptance or blog commment. Happiness is... a day off from work to sleep in and go out for coffee. Hi Linda - Yes, a child's giggle can change a so-so day into bright sunshine. Hi Jeanette - Ooo, I like that one a lot! Hi Karen - Isn't it funny how we become more aware of simple things with an analogy? BTW - Folks, I'm at the library right now. Battery back-up/computer woes have me offline at home. Hopefully, I'll be all set later tonight. What a great analogy! I usually get my hubby to do the high stuff when it comes to things like hanging curtains, so I don't know how that translates. LOL! Happiness is... a steaming mug of coffee on a cold morning in the campsite. Happiness is sunshine and time to read a good book. I am happy when that happens, really :) When I have a good book, there seems to be no time. When I have time it is raining, haha. So, when all three come together... that's happiness. Happiness is spending time with friends. Hubby and I have had more fun being with friends and fishing in one friend's pond. Hi Carol - My hubby's address is heaven, so he's not available. Hi Marja - Great combination! Hi Quiet Spirit - I love being with friends. Being able to relax and share...now there's happiness. ...a fresh blueberry cream pie. With real whipping cream and four happy boys. I adore blueberries, but will have to pass on the real whipped cream. Happiness is.... writing in a shack by the sea. That's what I'm doing for the next three days. And even though winter it still chilling us, this afternoon's sun would make you think summer is on the way. And that really makes me happy. Oh my goodness, Susan! I'm glad you're okay. 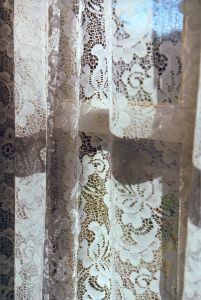 I hate hanging curtains too, which I why I don't have many, but we used to have lace ones which I thought were beautiful. Hi Dotti - Have a fun and productive writing session! Hi Jess - Thanks, I sure don't need any broken bones. I try to leave the climbing to others. Happiness is writing in my air-conditioned living room with my kitty sound asleep in his bed beside me. Susan, I know I've said this so many times to you, but I LOVE your knack for forming great analogies. I love lace curtains. I'm so glad you didn't get hurt. I almost had a similar accident with curtains. For me, happiness is getting some job done just right that I didn't think I could do. That fits right in here, doesn't it? Hi Jean - I second the A/C! With this steamy weather, mine has been on non-stop! I'm glad you enjoy these posts. Oh my, I don't like doing things piecemeal either! Unfortunately, that seems to be the norm around here. It's hard to get a nice block of time to accomplish tasks.